Click here for Transition Rules. A game will be made official after 3 innings if a game must be stopped due to weather. The two coaches should have discussions about any weather delays/game stoppage, but ultimately the decision is at the discretion of the home team due to the interest of players and home team facilities. Must have at least 7 players to start game. NOTE: If a team has only 8 players, no outs will be taken for the the 9th spot in the batting order. If you have 7 players, 1 out will be taken in the 8th spot of the batting order. A player can only play on one team and be on one roster. If a team has fewer than 9 players for a game, the team can be filled with players from a lower division (Example: Transition to Pee Wee) to get the team to 9 players. Taking a player within the same division from the same town that may have a bye that night will not be allowed. The opposing coach must be alerted to the situation for approval. 5-run limit per inning for the first 5 innings. No run limit in the 6th inning or extra innings. If a Pee Wee game is agreed to be ended early due to time limit (see rule #1), the final inning becomes the “no run limit” inning. A game shall be called after 4 innings if one team has a 15 run lead. A game shall be called after 5 innings if one team has a 10 run lead. Pee Wee base length will be 60 feet. Midget base length will be 65 feet, but Midget games can be played with 60-foot bases at the discretion of the home team. The pitching distance is 46 feet 6 inches for Pee Wees. Pitching distance is 49 feet for Midgets. Pee Wees cannot run on a dropped third strike. Pee Wees may NOT score by stealing home on a ball by the catcher on a pitch, wild pitch by the pitcher, or return throw to any position on the field from the catcher (“Home Plate Closed Rule”). Anytime a Pee Wee steals a base, the furthest he can advance is 3rd base on steal attempt/steal play. The only way a Pee Wee can score a run is a bases loaded walk or hit batsmen, or following the action after a hit ball of an offensive player. If the ball is batted in play, Pee Wees can advance as far as they would like per regular baseball rules until the infield/pitcher has complete control of the ball. 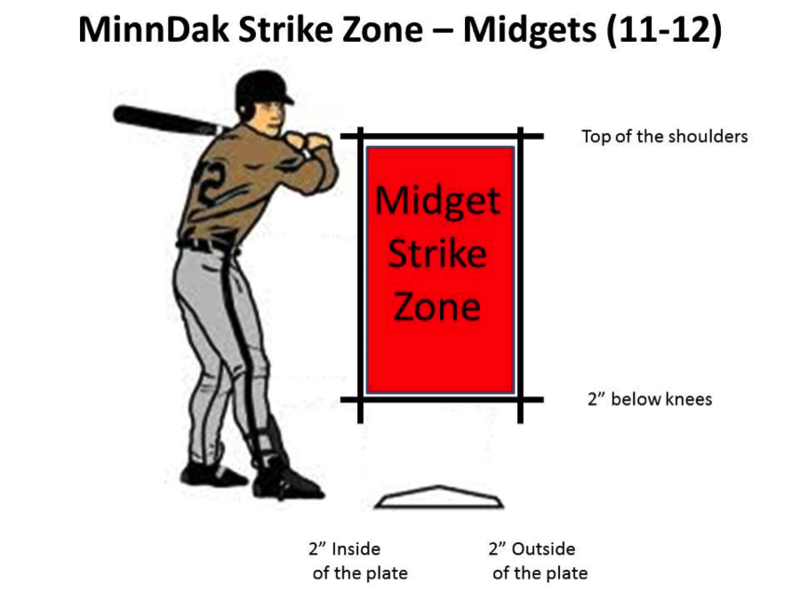 Midgets may run on a dropped third strike and steal home according to standard baseball rules. Pee Wees may steal after the pitch crosses home plate. Midgets may steal when the ball is released from the pitcher’s hand. Pee Wees cannot steal bases during the month of May. After May 31, stealing is allowed for Pee Wees. Stealing is always allowed for Midgets. Any runner is out when the runner does not slide or attempt to get around a fielder who has the ball and is waiting to make a tag. Pee Wees will not have an Infield Fly rule. Midgets will still use the Infield Fly rule. Pee Wees will not be allowed to throw breaking pitches. If a pitcher is caught throwing a breaking pitch by the UMPIRE, it will be called a ball. Pee Wees will not be allowed to intentionally square to bunt a pitch. Midgets will be allowed to bunt. * All bats must have a USA Baseball stamp. PeeWee & Midget pitchers may throw 3 innings per game. The innings must be consecutive without interruption. One pitch constitutes an inning. During the MinnDak year-end tournament, the innings per game rules remain in place; but in addition to that, a pitcher (Midget or Pee Wee) can only pitch up to 6 innings per day and 9 for the tournament. No automatic intentional walks. A batter must receive four pitches to walk. All Pee Wee and Midgets team members must bat, bat in order and must play a minimum of 2 innings in the field (tournament games included). NOTE: If a game ends because of run rule or time limit, the innings played rule will not be considered violated. If a player is injured within the course of the game and cannot take their turn to bat, that player will be skipped in the lineup with NO OUT taken, unless it brings the roster to seven players. An out would then be taken as noted in rule #2. It is understood that if the player is too injured to take their at bat, they are too injured to play the remainder of the game. If a player is able and only wants to play defense in the game and not bat, an out will be recorded for that player. A player must appear in 7 regular season games to be eligible for the tournament. Appeals can be made for extenuating circumstances. Appeals first need to go to the local town rep. If the town rep is unsure of decision, town rep will discuss with league commissioner. Decisions of the town rep and/or commissioner will be communicated to other town reps/coaches. The home team will provide the umpires and the baseballs for the regular season. Each game must be recorded to the MinnDak website. The home team will be responsible for entering the final score. If there is a discrepancy of final score, league commissioner can be contacted. League commissioner will then contact both coaches to settle discrepancy and update score if necessary.